The Construction of the first phase of the Surfers' Point Managed Shoreline Retreat Project is now complete. What's the plan? During Phase I, about half of the existing damaged parking lot will be removed and the materials recycled. The stretch of beach along this area will be widened by 60-feet and a new cul-de-sac on shoreline drive will be constructed 1,000-ft. east of the current turnaround. The multi-use bike path will be relocated inland along the beachfront adjacent to the new parking area that will be constructed just north of the existing lot. Beachgoers will have access to the shore and bike path during construction. 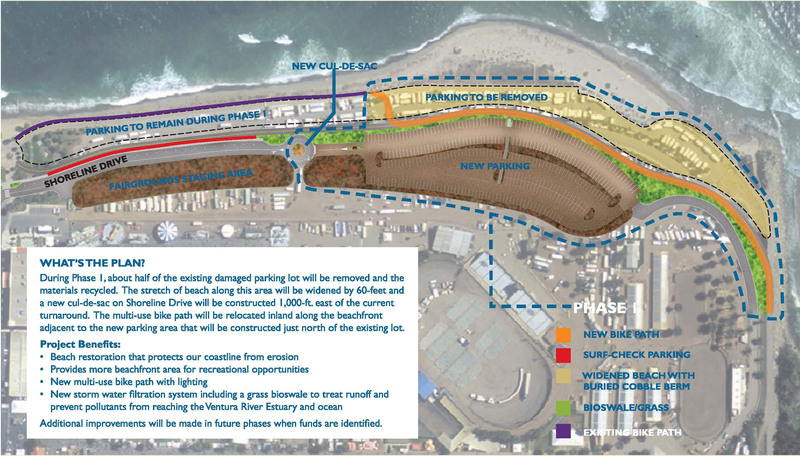 ample parking will be available at the remaining portion of the existing parking area along the beachfront and paid parking at the Derby Club/Ventura County Fairgrounds parking area; 20 minute "surf-check" parking will be added along the south side of Shoreline Drive prior to construction.